Basic vegan macarons have four ingredients: chickpea brine (aquafaba), almond meal, caster sugar and powdered sugar. How hard can something with so few ingredients be to make? MEASURE. If you have one little ratio off with any ingredient, your macarons will not turn out correctly. The MACRONNAGE. 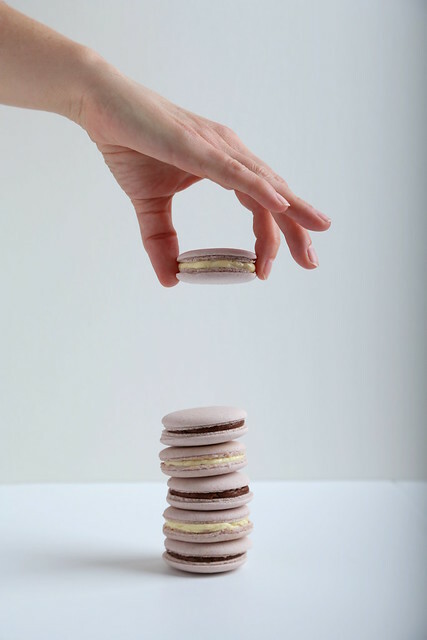 If you undermix or overmix the batter, your macarons may be too thin, too thick, collapse in the oven or not develop feet. See the 1:26 mark on Floral Frosting’s macaron video on how to do the macronnage correctly. SMACK the piped macarons on the counter to release any air bubbles. Don’t be shy with smacking them and don’t skip this step or your macarons will turn into a mess in the oven. DRY the piped macarons for two hours or until the tops are dry. If your house has any humidity, your macarons will not develop feet. 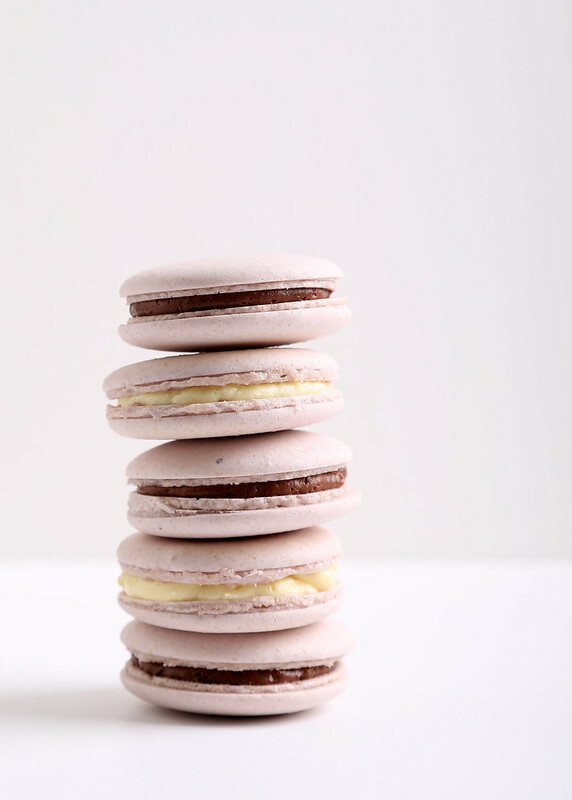 Run your air conditioning for several hours before and during making macarons, or only make them when the air is cold and the humidity is low. I learned this the hard way! The reason you want the tops dry is that the heat causes the air inside the batter to expand, pushing it upwards. Dry tops are stronger tops that aid in forming feet. Not-dry tops will result in the batter squishing through the tops, destroying your chance of getting pretty-shaped macarons. Lots of instructions will tell you to turn the batter 10, 20 even 50 times, but I found that turning the batter until it fell back into the bowl when lifted with the spatula and settled immediately worked better than counting. It took several batches to “get” how this should look. BAKING: Our oven is kind of possessed. It preheats very slowly, then jacks up very quickly, and the heat isn’t quite even. But we have a thermometer which helps with predicting the oven’s behavior/current mood. I first tried putting the piped macarons in a cold oven and bringing them up to 225 degrees, putting them into a preheated 225-degree oven, turning off the heat, venting the oven and leaving them inside until the oven was cool again. What I discovered is that using a pizza stone lined with parchment paper in a cold oven first worked best. However! All ovens are different, and what may be successful in one oven may not work in another. In all, making macarons was a fun, but sometimes frustrating, experience. 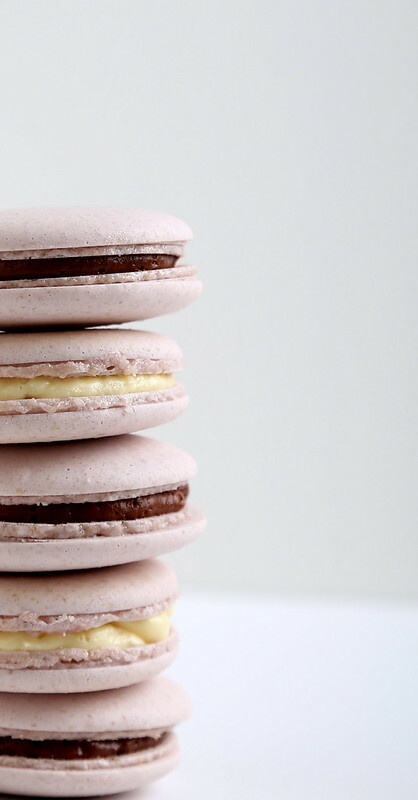 Watching your macarons get feet for the first time is totally worth all the work. Once your macarons are baked and cooled, they store well in the refrigerator or freezer. So that’s it! I won’t be baking or doing any technical desserts for a while now, but this was a fun project to figure out and tackle. Check out the Vegan Meringue – Hits and Misses! Page on Facebook for more tips on vegan+aquafaba macarons from some really amazing and experienced vegan bakers. Enjoy! I think I may have made over 12 batches! Worth it, though, to see progress. I hope you try it again with success! We live in Southern California — the humidity right now is at about 60%, which was probably a bit higher when I was experimenting in June/July. Some of the batches took even longer than two hours to dry, but I am not sure I can blame the humidity completely on that. (some of the batters were just more "wet" to begin with) All the more reason to measure correctly each time! Your low humidity sounds wonderful! Well, I like the humidity here whenever it's not winter… In our new appartment the humidity plummets to under 20% (and that is really irritating for eyes and skin, we just had to buy humidifier to stop the irratation! ), so yeah, it is perfect for macaron baking, but not living in general. Thanks for this blog, it's excellent!